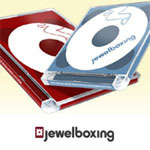 Jewelboxing: A spiffy jewel case you can use to house your next masterpiece on a CD or DVD. Think software, your latest album, your portfolio, or your next proposal. This case is pure rugged quality. Most of the garbage out there passing itself off as a CD or DVD case is wimpy, flimsy and decidedly unimpressive. With Jewelboxing cases you stand out immediately. Packaging and design are often what separate the winners from the losers. With these, you'll never be a loser. Jim Coudal personally shepherded my order through and was responsive, friendly, and efficient. After you order you'll get a digital design template for the case you selected in PDF/Illustrator/Freehand/Quark/InDesign/Pagemaker/Photoshop format, so you can quickly get after the task of creating top-notch innards for your Jewelboxing case. And to make it even easier the blank innards come with them too. And this is top notch paper, perfectly designed for consumer grade printers, the end result is radiant. So yeah, pre-perforated and scored trayliners, insert books and disc labels (with a few extras in case you screw up). These guys are easy to order from and have thought of everything. Here's what some other industrious folks have done with their Jewelboxing cases. Starting at $54 for a 20 pack of Kings, or 30 pack of Standards.